Great news! Is there any specific order that you are updating GarageBuy? So I know what bugs/UI experience I can focus on and report? currently we just updated the underlaying SDK so it properly runs on current macOS versions. 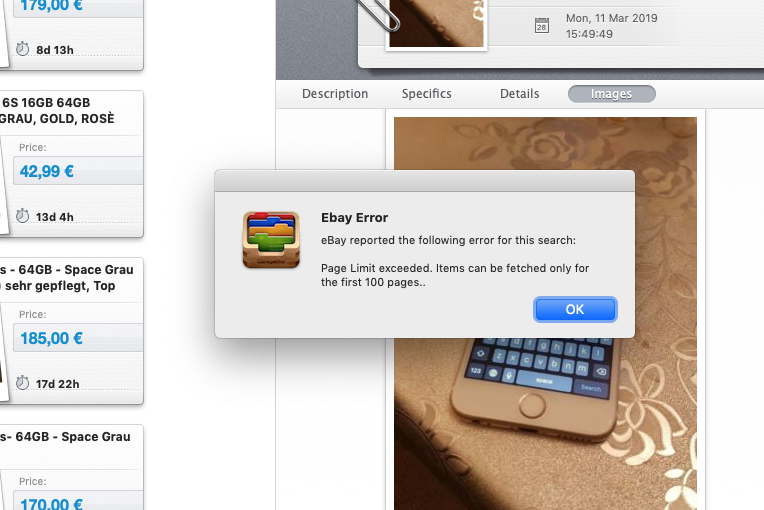 We fixed some retina related bugs and added a required header above the details for eBay. Seems a little buggy. I replaced an older version - which I didn’t use - with beta. Spinning wheel symbol against several searches which never seems to finish. GaragePay imports searches but sets them to search in All Categories whereas on ebay they were set to search in books only for the vast majority. This new release is 3.3 yet 4.0.2 is available on the App store. Are there two different versions of GarageBuy? The version for iOS is GarageBuy 4.0.2. The version for Mac is 3.2 (3.3 is in the works). Hi I really like the design of this app but one thing that keeps me going back to the standard ebay app is I can’t see if the seller accepts offers. Also shipping cost should be below the main price in the same view. Sometimes I get this window. After clicking OK alle the loaded listings disappear. if this happens it might help to narrow down the search in the search options. Thank you Kristian, my main point was that the loaded listings disappear. I can’t favourite an item if i see one because I need to click OK to get rid of the warning.